The California Public Utilities Commission (CPUC) recently held the first of a series of Public Participation Hearings (PPHs) regarding the sale of Verizon Landline assets in California to Frontier Communications. CPUC Commissioner Catherine Sandoval is personally traveling around the state for these hearings and to hear directly from residents about their concerns. Read about the first of these hearings that was held on July 6th at the Benbow Inn in Humboldt County. Expanding broadband services in rural areas is difficult for many reasons, including the methodology used to collect data for the State Broadband Coverage Map. This map is created by the California Public Utilities Commission (CPUC) from “advertised” coverage and speed data provided by the Internet providers, such as AT&T, Verizon, and Comcast. In a huge breakthrough for consumers, the CPUC is now accepting input directly from residents to validate/invalidate these advertised coverage/speeds. This improved accuracy will help the CPUC to guide effectively broadband subsidies to areas of greatest need when grants are reviewed for broadband expansion. Mail-in paper survey: Complete, sign, and mail the CPUC Mapping Survey (pdf) to the address at the bottom of the survey. Online: Visit the online map at www.broadbandmap.ca.gov. You can complete this survey from any place with Internet service if you don’t have service at your house. Select the House icon, third down from the top on the right side of the map. This is the “Address Lookup” tool. A box with service providers in your area appears, and directly above it you will see the link “Send Feedback.” Click this link and the survey will appear on your screen. Answer the questions and submit the survey. CalSPEED Android mobile app: If you have an LTE-capable Android smartphone or tablet, you can download the CalSPEED mobile testing app from the Google Play app store and test the quality of the service available at your location. Tests done in areas with no service will be reported to the CPUC automatically the next time you enter an area with service. Testing must be done outdoors while stationary (i.e. not in a car). Feel free to use the app frequently, at a variety of locations. The information you provide will be incorporated into the consumer feedback layer, and to validate or invalidate provider’s service availability information. The Broadband Alliance of Mendocino County was the only community-based respondent out of a total of 24 from all over the nation to inform the Federal Communications Commission (FCC) that access to broadband capability is, in fact, NOT being adequately deployed to citizens and businesses in Mendocino County, thereby contradicting assertions by major telecommunications providers that it is adequate. The National Broadband Plan refers to the “broadband ecosystem” as the way information is transmitted or delivered quickly (minimum download speeds of 4 Mbps relative to less than 1 Mbps from dial up or regular DSL) from place to place, and includes ways in which it is used (applications or content like email, search, news, maps, purchasing) as well as the networks used (cable, fixed fiber, wireless, cellular, DSL, satellite) and the devices available for connection to the networks. On September 6, 2011, the Alliance submitted its report to the FCC, which is conducting an inquiry to “determine whether advanced telecommunications capability is being deployed to all Americans in a reasonable and timely fashion”. Download the Alliance’s full report to the FCC. The Alliance reported that the FCC’s deployment data on its map is not correct. 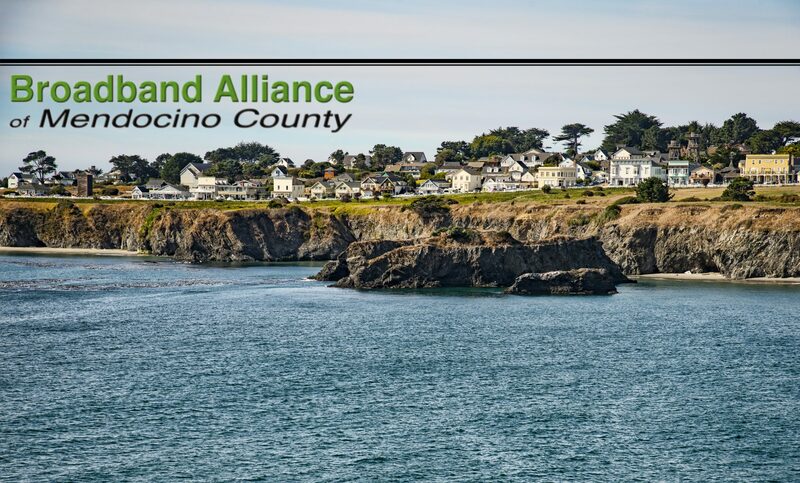 It currently indicates that 84% of homes in Mendocino County have access to high performance broadband speed Internet service, while the Alliance’s own research indicates that approximately 50% of residences do NOT have access to broadband capability. The Alliance stated that the reason for this discrepancy appears to be that the FCC relies heavily on information provided by telecommunications providers, who seem to have a vested interest in overstating deployment information in hard-to-serve areas. The Alliance told the FCC that the agency needs credible deployment data that is obtained independently of broadband carriers, performing in-the-field validation of that information. The FCC also needs to better assess the needs of unserved and underserved “really rural” communities and provide more financial assistance so they can develop solutions that actually achieve broadband deployment. Mendocino’s efforts are 100% volunteer at this time with inadequate funding to hire necessary professionals and do the work. The Alliance is currently asking all Mendocino County residents and businesses, whether served or unserved with high speed Internet, to respond to a Survey to help prove its statistics as a way to correct the FCC maps. It will take the involvement of all to get coverage necessary for personal convenience as more and more is being required to be done only online, computer updates get bigger, and for economic renewal.